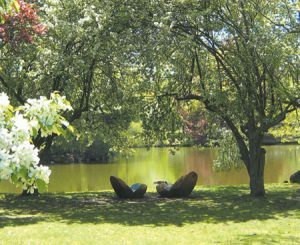 LONG BEFORE BOSTON HAD PUBLIC PARKS, Forest Hills Cemetery was created to offer visitors a special place where they could enjoy a magnificent landscape while remembering friends and family. Sculpture became an essential feature of this environment, as people commissioned local artisans or prominent artists of the time to create individual and family memorials. No visit to Victorian Boston was complete without a trip to Forest Hills to see the latest in fashionable art and architecture. All of what we now perceive as historic sculpture was contemporary in its day. The Trust began exhibitions of contemporary sculpture and site-specific installation work to revive the 19th century practice of engaging artists to design work for this unique landscape. FOREST HILLS CEMETERY WAS ONE OF THE FIRST places the public could view art. The Cemetery was established in 1848 and Boston’s Museum of Fine Arts did not open until 1870. The Cemetery is also one of the city’s first parks, designed 30 years before Frederick Law Olmsted began work on the Emerald Necklace. The Trust works to preserve the historic character of this grand Victorian landscape, so innovative in its day. However, we also recognize that this environment — which is an active cemetery with daily burials — is not “frozen in time.” It continues to evolve in ways that reflect the spirit of contemporary society. Our Victorian sculpture collection was modern in its day, and the Trustees of Forest Hills have launched The Sculpture Path to welcome the work of contemporary artists into this unique setting. Established in 2001, the Contemporary Sculpture Path is composed of a small permanent collection as well as works on loan for a year or more. A list of the artists, photographs of each work, and short artist’s statements are available. The Contemporary Sculpture Path is supported by contributions from individuals and grants from foundations — the Massachusetts Cultural Council, and the Boston Cultural Council, a municipal agency which is supported by the Massachusetts Cultrual Council, a state agency. Below is a list of the artists whose works are currently on view in Contemporary Art: The Sculpture Path. Many other artists have participated in this project over the years, and a full list of those artists by name and the titles of their works are also included, below. I am committed to figurative language in art. Through this language, I express my interest in themes involving humanistic ideals, particularly those that deal with women and children. Step on Board, my most demanding and historically significant commission, depicted the hale Harriet Tubman as a determined, visionary spirit who inspired men, women, and children to overcome the perils on the road to freedom in the antebellum South. The Sentinel is my most recent large sculpture. Her mission is to observe all the transpires. 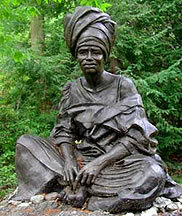 She is the wise old woman of Africa, the Sentinel. 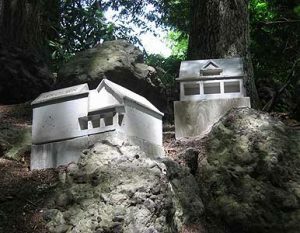 Miniature houses cast in concrete cluster on a rocky outcropping, creating a new neighborhood. Each house is modeled on the home of someone buried at Forest Hills. The range of styles, from Queen Anne mansion to modern split level, reflects the economic and social diversity of generations of Bostonians buried here. I conceived Neighbors as a way to address ideas of the physical home before and after death. The piece compares the dwellings of individuals in life and the “dwellings” created for them after their deaths. Each concrete building is a replica of the home of a particular person buried at Forest Hills. I chose structures from the thousands of possible residences in order to include a variety of architectural styles. Just as the houses’ architecture reflected the diversity of their occupants’ background, social status, ethnicity, and other traits during their lifetimes, so the architecture of their monuments and grave sites reflects those traits after their deaths. In most cases I was able to find and copy buildings that still exist today, suggesting that the architecture left behind and then reinhabited by the living can carry the memories of those who have passed on. The houses represent the residences of Charles Varney Whitten, merchant (1829-1897); Mary Hunt, temperance leader (1830-1906), John A. Fox, architect (1836-1902); Joseph H. Chadwick, industrialist, whose Gothic Revival mausoleum is on Fountain Avenue (1827-1902); Ralph Martin, wagon-driver, who perished in the Great Molasses Flood; Samuel S. Pierce, grocer (1807-1881); and Anne Sexton, poet (1928-1967). 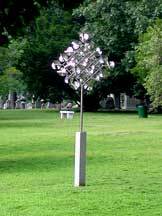 Originally exhibited at Forest Hills Cemetery as part of ReVisited. Discovering this line in Shakespeare’s play Troilus and Cressida, helped crystallize the sculptural format for a series of smokestacks and vents that I have been considering for some time. Ancient or modern, these simple objects present a duality that is at once ominous and graceful. They represent a structural contradiction: thousands of tons of steel and concrete used to vent the most ephemeral of substances, smoke and steam. As metaphors they are powerful engines, reverberating with the sounds of wounded societies, venting corrosive anger and regret. Walking the grounds at Forest Hills, I realized that I was among generations who once contemplated and experienced life just as intensely as we do. As I looked at the names and dates on the markers, studied the ornament and craftsmanship, the symbolism and the history, I felt a certain kinship. I would truly enjoy hearing their thoughts, especially from their historic perspective, on my choice of this object and icon as a vehicle of thought. Perhaps a lively debate is even now in progress. Obelisks, with their association of enduring greatness, became popular for family memorials after Napoleon’s Egyptian Campaigns. Their pure uplifting lines were considered in the best taste and they could be used in relatively small spaces. In contrast, Memory Jugs were a folk art form consisting of a recycled ceramic vessel covered with personal items embedded in putty. 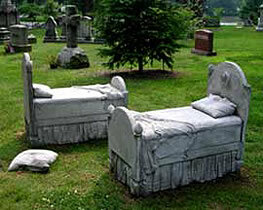 Some think that they were originally made by slaves and often used as grave markers. We have combined these two concepts to allow the funky, personal Memory Jug to become grand, and to make the elegant obelisk less austere. In Egypt, obelisks were covered in hieroglyphs describing the event they commemorate. Here, the surface of china pieces and other memorabilia replace inscriptions, integrating the evidence of lives past and present. 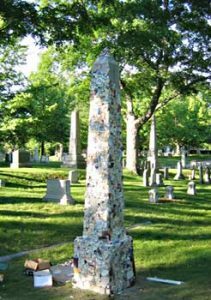 The primary mosaic material is china shards collected at Carson Beach in Dorchester – domestic fragments which give a glimpse of many personal histories, now lost. To this, individuals have donated their own personal memorabilia – buttons, belt buckles, keys, beads, solo earrings, marbles, old coins. The combination of objects honors old memories and stories while creating new ones. The bed is the place of conception, sleep, sickness, healing, and eventually death. A bed, a place to rest on a daily basis, is a need common to everyone. 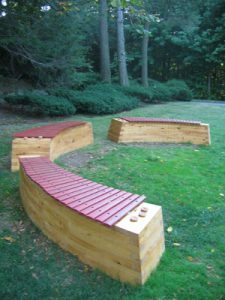 In response to the environment of Forest Hills, we chose to make benches shaped like Victorian beds to play on various interpretations of the notion of a resting place. The concrete suggests an eternal nature, the bed a place to sit, to rest. Created during an artist-in-residence program with students and teachers from the Little House School and poet Elizabeth McKim. 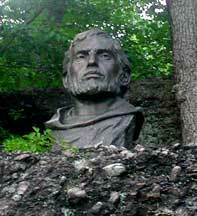 The Franciscan depicts Fray Garcia de San Francisco who was the founder of the first mission at the Pass of the North in 1659. This mission became a frontier way station for early explorers and merchants and later evolved into the twin city metroplex of El Paso, Texas, and Ciudad Juarez, Chichuahua, Mexico. This bust was cast from the mold originally used to create the imposing figure of this Franciscan priest for downtown El Paso, as part of the XII Travelers Memorial of the Southwest. I am interested in the dynamic relationships of objects in motion and their interaction with the outdoor environment. Flock of Birds celebrates this idea and is inspired by the aerial ballet of swarming birds, often seen as multifaceted, mirror-like arrays along the seashore and coastal wetlands. The sculpture explores the qualities of light and playful choreography of an organized grouping of rapid, small movements within a larger, slower movement. The rotating. metal surfaces break up and reflect back angular fragments of light from the natural surroundings, a kind of animated, Cubist painting. 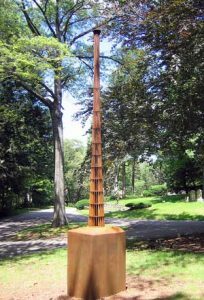 Within the peaceful setting of Forest Hills Cemetery, the sculpture becomes a portal for indicating the evanescent flow of spiritual energy.